June 2 2018. The online registration for the 2018 USATF Masters Half Marathon Championship has closed. There may well be some last minute entrants at packet Pickup on Saturday but if so, they will not be previewed here. The earlier preview posted on May 21, 2018 has the baseline preview and predictions. This post is an update based on entrants from that date until the close of online registration on Wednesday May 30. In addition to change in entrants, the weather forecast has been updated. The temperatures and wind have not changed much; both are favorable, with temps rising from the upper 50's through to the upper 60's during the race. Earlier forecasts were for mostly sunny skies. Current forecasts call for a possibility of light ran during the race. As long as that is not sufficient to cause slippery conditions under foot, it is probably a net gain for the runners in the Championship. No new contenders for the Men's Championship have popped up in the ensuing week. The earlier preview stands as written. Even though Sam Teigen is not picked for the podium, he is very capable and has had strong outings on the roads this year; he could be a surprise podium finisher. David Angell Gregory Mitchell Olivier Vrambout. There are new contenders for the Women's crown but the prediction for the winner is unchanged. Melissa Broyles and Erin Larusso will try to make things a bit more interesting in the Overall race. Broyles finished 4th in the recent 5th 3rd River Bank Run [25K],finishing in 1:45:18, hitting her Half Marathon split in 1:28:24. As Gacek finished 2nd in that race four minutes ahead of Broyles, it seems likely that Gacek will maintain her edge. But Broyles will, no doubt, make an effort to stay with Gacek a little longer on Sunday. Larusso will also challenge and is a good bet to make the podium although it would be a stretch for her to match either Gacek or Broyles. Larusso's most recent Half Marathon was a 1:30:14 effort at the Akron HM last year. The 1:07:18 she ran at the Crim 10 Miler suggests she might be able to improve a bit on the Akron effort. The Crim result is age grade equivalent to a 1:28:56 HM. There is no reason to second guess the prediction of Rick Becker, 62, Gene Dykes, 70, and Roger Sayre, 60. They are all likely to turn in World Class performances of 90% or better. But there are few certainties in competitive distance running. Should any of those three have an off day, there are a few others who will be pushing the age-grade pace. Should either Greg Mitchell or Olivier Vrambout, both 44, get down around 1:10, they would score in the upper 80's and might make the podium. 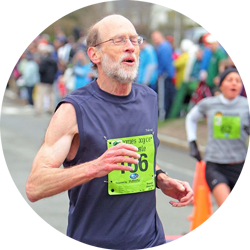 Dave Walters, 62, ran a 1:21:35 Half Marathon last August. If he could match that, he too would score in the upper 80's. Michelle Simonaitis, 52, is now entered and could be a factor in age grading, but she will need her best outing to make the podium. At the 8K she finished just behind the initial favorites for this race, Doreen McCoubrie, 56, Jeanette Groesz, 68, and Suzanne Ray, 66; McCoubrie edged Groesz 91.87 to 91.82, with Ray at 90.21. At the 10K, Simonaitis came in ahead of Ray, who had an off day, but behind Groesz again; McCoubrie did not contest the 10K as she ran the Boston Marathon instead. Patrice Combs, 60, could also factor into the age grading contest. At the 10K, she finished behind Groesz but ahead of Simonaitis and Ray. Groesz and McCoubrie both contested the Half Marathon last year and Groesz edged McCoubrie by a half percentage point. Ray ran a Half Marathon in 1:37:15 and ran 1:08:59 at the 15K Championships in Tulsa; that is age grade equivalent to a 1:37:58. If she can shrug off her race at Dedham, and turn in something like a 1:38:00 or faster, she could well win the contest by age grading at 93% or higher. It is a very tough contest to call. Ten days ago I thought the order would be McCoubrie, Groesz, and Ray. If I base it on the 8K, McCoubrie makes sense, but that distance is quite a bit shorter than the HM. On the other hand, McCoubrie loves the longer races so maybe last year was just off for her in the HM and 15K. If I base it on Ray's HM and 15K last year, she becomes the favorite, but I have to balance that against a subpar outing at the 10K last month. Was it just an off day or was it due to an injury that will have lingering effects? Groesz is just steady, almost always on the age-grading podium. I will stick with my earlier call, but the order could easily be changed and Combs could find her way onto the podium. Simonaitis is a bit more of a long shot but certainly capable as well. 40-44 Nothing new here for the men, although Sam Teigen will not be far off and could wind up on the podium if he has one of his best days or if anyone else is a bit off. As noted above, local runner, Melissa Broyles, will try to stay with Melissa Gacek longer than she did at the recent Fifth Third River Bank Run, where Gacek finished 2nd and Broyles 4th. In that race, Gacek forged a minute and a half lead in the first 7 miles and grew it to nearly three minutes by the 12 mile mark. As of now, Janice Rumph is the 3rd runner entered and needs only to finish to wind up on the division podium. 45-49 The earlier analysis of the Men's race holds with no amendments. Erin Larusso is now entered and the favorite for a podium finish overall. She should win the division handily. There is a good chance she can crack 1:30 but as long as she is near that, she should take the division. GVH teammates, Caroline Bucci and Melissa Senall, should both come home under 1:45 and if either has a strong day, a sub-1:40 is not out of the question. Bucci's most recent Half Marathon is a 1:43:20 from 5 weeks ago whereas Senall's 1:42:27 is from March of 2017. It is really a toss-up but I will go with Bucci because of the more recent HM outing. The entry of Michelle Simonaitis changes things for the women. Simonaitis is likely to run around 1:30 or better. That should be enough to take the division title. Dana Blum and Kris Huff both have recent HM's in the 1:37:30 range. Since Blum's time was 21 seconds faster than Huff's, I made her the favorite for the 2nd place finish and see no reason to change that. 55-59 There are no major changes, but having a little more time to ponder this division makes me realize I was over-weighting the update on Dennis Kinney's 2013 1:24:01 in the Flower City HM. John Van Kerkhove has been battling to come back from an injury over the last year or so. Nonetheless, Van Kerkhove came in a minute and a half ahead of Kinney at the 10K Championships in Dedham last month. That suggests Van Kerkhove's current fitness may be superior to Kinney's. Van Kerkhove has apparently run nothing much over 10K in the last few years but in 2014 he ran a 58:05 15K which suggests that at the time he could probably have broken 1:23 at that time. With a 1:22:43 at the 017 Half Marathon Championships, Jim Zoldy remains the favorite to take the division crown. But with a 3:15:52 at Boston this spring and a 56:45 15K, Leaman should be able to come in ahead of Van Kerkhove and Kinney, and may have a legitimate shot at the title. The 15K time is age-grade equivalent to a 1:20:45. Jeff Rothstein could also challenge for that final spot on the podium. His 1:02:36 15K from last November is age-grade equivalent to a 1:29:05 HM. Karyl Sargent and Nancy Schubring are now entered and should be in the hunt for a podium finish. Doreen McCoubrie is still favored for the Division title. Even if she can just match her 1:29:33 from last year's Masters HM Championships, she should take the title. And, based on her 31:33 win at the 8K Masters Championship in March, she may run faster this year. Sargent ran 33:25 at the 8K and 42:36 at the 10K Masters Championships this spring. It seems to much of a stretch for her to catch McCoubrie but she may well have enough fitness to compete well with Beth Ann Ciantis, Kelly Dworak, and Janet Smith. Sargent's best recent HM was a 1:42:52 HM in February in New York, but that may have been run under difficult conditions. Her recent 10K time suggests she should be able to run under 1:35. If so, she should claim 2nd. Dworak and Smith are both capable of running around 1:38, with Ciantis not far off. Schubring also has run her Half Marathons in the 1:38 to 1:40 range. As with the earlier prediction, I will give the edge to Dworak based on her recent 1:38:13 Half Marathon. 60-64 The changes are that I found a 1:21:35 Half Marathon for Dave Walters and that Vermont's Norm Larson threw his hat in the ring. Ordinarily with Larson, he would be a sure bet for the podium but this field is packed. Larson will most likely be fighting for a top 5 finish. Roger Sayre has the best recent Half Marathon at 1:18:40 and 1:19:16. Of course both are point-to-point and downhill but offsetting that, at least partially, is the altitude. He also has a 55:29 15K on Tulsa's tough 15K Masters Championship course; that is age-grade equivalent to a 1:18:58. It seems likely he could break 1:20 or at least come close. And he had a better age-grade than Rick Becker at Club XC this past December, suggesting he should be favored here as well. Becker runs great on all surfaces but he is especially dominant on the XC turf. That Sayre could outpoint him suggests he should be favored for this HM Championship. But Becker will push him all the way. His 44:26 at the recent Lilac Bloomsday 12K, which is known for its tough course, is age-grade equivalent to a 1:19:54. Walters looks like a good bet for the final podium spot. Martin Lascelles, Norm Larson, and Michael Young should all come in somewhere around 1:25 or 1:26. Another intriguing entrant is David Burkhart, primarily a tri- and du-athete. He ran 39:23 for the 10K in a recent triathlon. There is one significant change since the earlier preview, while most things remain as previewed then. Patrice Combs seems likely to run a sub-1:35 and that should still be enough to take the win easily. If Lyn Bernot can run close to the 1:47:08 she ran in the San Diego Holiday HM, she should claim 2nd. After that, it should be another duel between Cheryl Guth and Joanna Harper, but with a Michigan wrinkle. Harper edged Guth by a single second at the Masters 10K Championships in Dedham. Both seem capable of running in the low to mid 1:50's. Harper ran 1:51:27 at the 2017 Half Marathon Championships last May, while Guth ran 1:54:37 this April and a 1:48:37 at an HM last July. A new entrant, Carol Poenisch, from Northville Michigan, about 20 miles out of Ann Arbor appears to be in their league. She just clocked 1:54:25 at the Rock CF Rivers HM in March. It looks to be a toss-up between Guth, Harper and Poenisch. I will assume Poenisch has a home course advantage and give her the third place prediction. 65-69 Heath Hibbard is now entered in this division. He ran 39:55 in a 10K in early December and ran 1:03:10 in the 15K Championships over the tough course at Tulsa. That 1:03:10 is age-grade equivalent to a 1:29:59. Of course that is not the same as running a 1:30 HM but it does not seem like anyone else is ready to run that close to 1:30. As I noted in the earlier preview, I give the edge otherwise to 3-time Age Division Runner of the Year, Terry McCluskey, who clocked 1:11:06 in the Cherry Blossom 10 Miler which is age-grade equivalent to a 1:34:17 but if he can manage something closer to the pace he put down at the Crim 10 Miler last August when he ran 1:09:03, he will press Hibbard. John Hirschberger, Jerry Learned, and Eduardo Matsuo will probably not be far off McCluskey's pace. Hirshcberger ran 1:34:31 at the Masters HM Championship in So Cal last May. His recent 1:14:20 outing at the Norcal John Frank Memorial 10 Miler was not as impressive. Learned is a tough runner who is racing consistently well recently. On the other hand, I cannot find a Half Marathon for him within the last half dozen years. Based on the 1:06:58 15K he ran in Tulsa, it appears a 1:35 HM would not necessarily be out of his reach. Matsuo ran 1:34:44 at the Dexter Ann Arbor HM last year. With that kind of recent performance, I give Matsu the edge in terms of the third place spot. Nothing has changed on the Women's side of this division. Suzanne Ray should still win, as long as the subpar performance in Dedham is just a one-off event rather then being indicative of some lingering injury. Victoria Crisp and Jeannette Groesz will fight it out for 2nd and 3rd, with Crisp favored on the basis of slightly faster recent 10 mile and Half marathon times. 70-74 Nothing has changed in this division except the rumor that Bill Dixon might enter has not materialized. It seems unlikely he would wait to register until Saturday, although that has been fairly common practice for him with the 5K Championships in Syracuse. Perhaps the rumors confused Dixon who is from Brattleboro VT, with Norm Larson who runs for the Green Mountain Athletic Association. Assuming Dixon does not show up at the last minute, the earlier preview can stand. Gene Dykes, who bested Dixon at the 10K Masters Championships and broke the American Marathon record in Rotterdam this year with a 2:57:43, should win with minutes to spare. Dave Glass and Lloyd Hansen should battle for 2nd and 3rd. I give Hansen the edge, in part because he ran 1:35:51 in the HM Masters Championships last year and also has a 53:15 12K on the tough Lilac Bloomsday 12K course in early may of this year, which is age-grade equivalent to a 1:35:56. Glass has recent 15K's which suggest he can run around 1:35 in the HM and it is also true that he came in a half minute ahead of Hansen at the 15K Masters Championship last year. But Hansen also appears to be running a little stronger this year after recovering from a sciatic nerve issue that plagued him for a year and a bit. As I mentioned at the time, Gene French, Przemek Nowicki and I [Paul Carlin], who have landed on the Masters HM podium in the past, have fitness issues. Nowicki won in 2016 and I won last year, with French in 3rd. French was running strong at the end of last year but ran into some problems this year and could only manage a 1:22:26 at the Sactown 10 Miler which is usually thought of as a flat, fast course. I only ran 20 seconds faster at the Papa John's 10 Miler, which is known for its tough hills over the middle section of the course. Just in the last two weeks, though, I feel I have largely put the high hamstring problem behind me. When I step to the line on Sunday, I will not be race fit, but I should be as close to being whole as I have been since May 2016. I should be more competitive later in the summer and fall. The major change for the women is that Jo Ann Rowland will not compete after all. Her hamstring problem has hampered her training too much. If there are no additional entries,Irene Terronez only needs to finish the race to claim the division Championship. There are no updates to the Team Previews; the earlier analysis can stand. Things will probably change at packet pickup. Most likely GVH will find a way to field a Women's 40+ team. The Ann Arbor Track Club is also trying to field a Women's 40+ team. If they are successful, there will be a race in that division. But no changes are known at this point.